The viewer may be resized or closed after launch. Bookmarkable links to any particular view or selection of layers are provided by the Permanent Link option in the viewer's table of contents. Richard J.A. Talbert, Rome's World: The Peutinger Map Reconsidered (Cambridge University Press, 2010). For more information about this map, please consult the brief User's Guide (PDF). 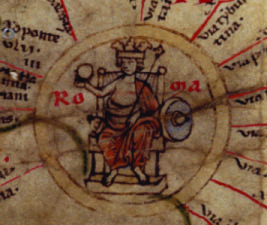 Additional resources, and information about the print components of the entire work, may be had from the Rome's World: The Peutinger Map Reconsidered web page, hosted by Cambridge University Press. This map viewer is hosted as a courtesy to the author by the Institute for the Study of the Ancient World at New York University. All questions, comments and inquiries should be directed to the Ancient World Mapping Center at the University of North Carolina at Chapel Hill. Copyright © Richard J. A. Talbert, 2010.